Noah’s mouth is a dangerous place to be these days! He’s seriously like a little alligator. He’s only 14 months old and already has a mouth full of teeth…and today it was time to get thoselittle chompers checked out! Our awesome neighbor came over with all of her tools (and gloves) today, checked out Noah’s mouth, and even applied a fluoride varnish right here in our living room! It was quick and easyâ€¦well, sort of easy. As you can see in the video he did ok with the exam part of the visit, including the brushing, but he wasn’t a huge fan of having that fluoride varnish put on. Noah doesn’t really like anything (or anyone) coming near his mouth unless it’s foodâ€¦.or drinkâ€¦or toys. So I was surprised how great he did, he didn’t even bite down on her fingers! Since Noah is our first child, we really didn’t know a lot about the dental side of things. I thought my wife would know considering she’s a pediatrician (but it turns out they don’t cover dentistry in medical school.) Thankfully our neighbor is not only a kid dentist, but she also teaches at the dental school so we we were able to pick her brain on a few things while she was here. A lot of this may may be common knowledge to most of you, but it was new to me. So I thought I’d share some of the things we talked to her about just in case any of you may be wondering some of the same things. 1. 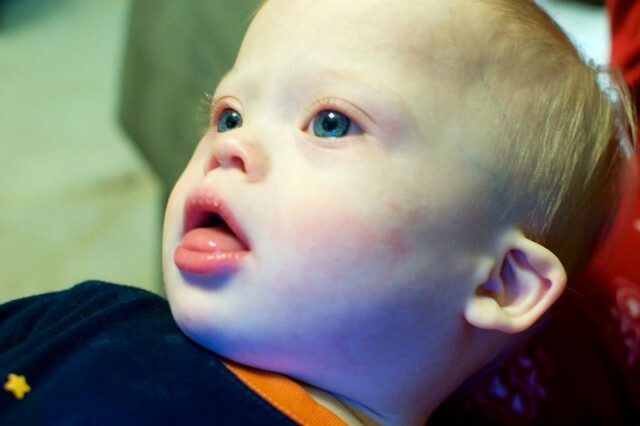 Do I need to take my child with Down syndrome to a special dentist? By the way, if you’re looking for a pediatric dentist in your area the AAPD has a great tool on their website to help you do just that. 2. When I should I take my child to the dentist to the first time? 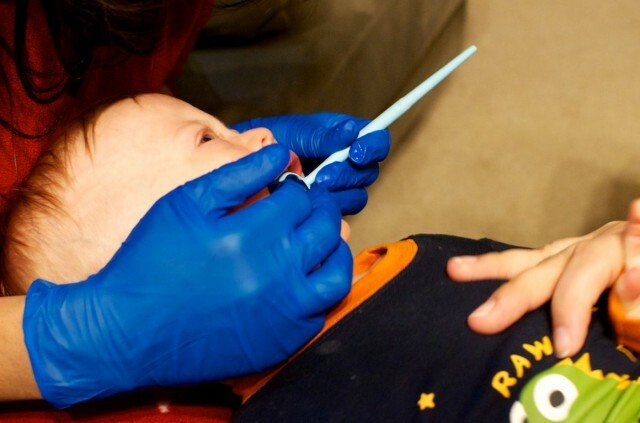 You want to make an appointment to see a pediatric dentist for their first check up as soon as their fist tooth comes in, or no later than their first birthday. Remember, often times life prevents us following guidelines like these perfectly. So if you’re like us, and didn’t get your child into the dentist by their first birthday, or when their first tooth came in, don’t feel guilty. Heck, We didn’t even know we were supposed to do that. 3. When type of tooth brush should I use to brush my child’s teeth? 4. When can I start using tooth paste on my child? 5. Is grinding your teeth normal? Noah is a teeth grinder. In fact, sometimes it’s so loud it sends shivers up my spin. We asked our dentist about this and were told that it’s actually normal for children to grind their teeth at this age. “Children exhibit teeth grinding very commonly. We see it in children younger than 7-8 years old often. A lot of children will stop grinding once their six-year permanent molars erupt. Their permanent teeth bite begins to establish itself once those molars erupt. 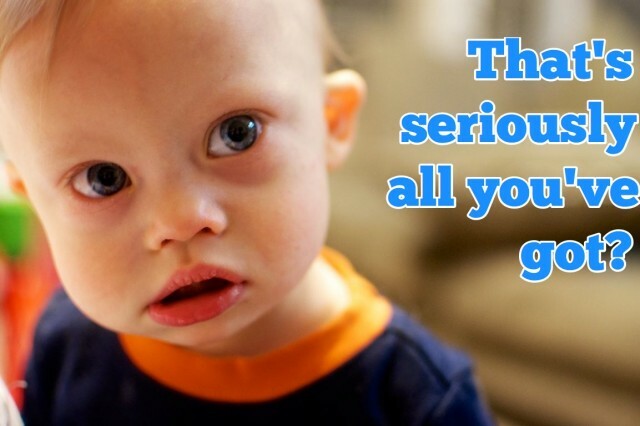 Of course every child is unique, and you’ll want to talk to your child’s pediatric dentist about any unique concerns you may have about your child’s grinding. However chances are if your toddler is grinding his teeth, you have nothing to worry about. 6. Is it ok for my child to drink juice? Juice contains a lot of sugar and can be very bad for children’s teeth. Even though my wife and I are very aware of the ill-effects of to much fruit juice we still let Noah sip on an occasional juice box, but not often. I’m sure there are some perfect parents our there who never give their children an ounce of sugar, but we aren’t one of them. However it doesn’t drink it all the time. Noah drinks a ton of soy milk (due to a milk protean allergy) and so that and water are his two main drinks, but we like to switch it up every once in a while and fill his straw cup up with some tasty juice. On a quick side note, if you’re one of those parents whose kids I’ve seen walking around the grocery store with a bottle full of soda, that’s not cool. For one, I think we can all agree soda is not healthy for anyone, kids or adults (although I sure do enjoy an ice cold Dr. Pepper.) Second, a toddler certainly shouldn’t be drinking soda. And third, if your child can walk, chances are he shouldn’t be drinking out of a bottle any more. Just saying. I hope you found this information useful. I’m always learning, so feel free to share any of your dental wisdom in the comments below. How does your child behave at the dentist? Do they enjoy going, or is it a nightmare to get them in the chair like it is for me? Yelp, I’m deathly afraid of going to the dentist, and I”m not afraid to say it! I still go (just had a great check up / cleaning) but man oh man, I don’t like it! Leave a comment and tell me about your child’s dental experience. I read some important dental tips from your blog. It can be helpful for our dental problems. Just read your blog about the dentist n teeth stuff…just wanted to know how can I teach my 3 year old to spit the toothpaste not swallow it.she doesn’t understand n swallows it anyway.I’m so worried.can u please give me ideas n tips for this. Thanks for all your blogs.my whole family loves Noah very much. Bless you all.